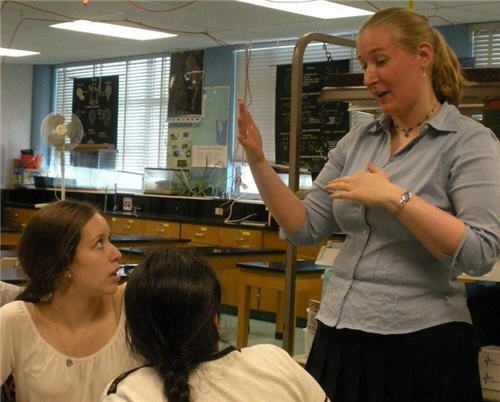 Science teacher Kathryn Sander talks with students about GeneEd. At the beginning of the new school year, NLM in Focus is highlighting the National Library of Medicine’s unique educational resources. These resources can be used in schools, libraries and other community settings, and at home. The free, online materials include lessons plans and interactive exercises, developed with teachers and subject matter experts. Topics range from genetics to global health, chemistry to careers, and the environment to the humanities. Berneatta Barnes, a science teacher in Washington, DC, said the resources address some of the challenges teachers encounter. “Teachers face difficulties with obtaining good resources that address all the learning styles they encounter in their classroom,” she explained. It is especially difficult, she noted, to find reliable resources in science that offer hands-on activities. While NLM has a wealth of Web content that’s helpful to anyone looking to learn about science and medicine, two divisions in the library have taken the lead developing classroom resources. They are the History of Medicine Division (HMD), through its exhibition program, and the Division of Specialized Information Services (SIS). Two key points of entry to explore these resources are the HMD Exhibition Program Education Services Web page and the SIS K-12 Science and Health Education Web page. SIS has developed resources for environmental health and worked with NIH’s National Human Genome Research Institute to create the genetics resource GeneEd, which links to articles, animations, games, videos, interactive tutorials, labs and experiments. Science teachers often use GeneEd and NLM’s Genetics Home Reference site to help students with science terminology. Students can see 3-D images when they link to an area of interest and then use the talking glossary found on GeneEd to hear the words pronounced as well as see the images. SIS also offers a wide-ranging Environmental Health Student Portal, with interactive topics on Air Pollution, Chemicals, Climate Change, and Water Pollution, all vetted by trusted, reliable sources. The portal also includes engaging educational animation that uses graphics and humor to teach challenging, conceptually complex topics, for which teachers may have difficulty finding good multimedia resources, such as the health effect of mercury or water desalination. Another popular SIS site, Tox Town, focuses on hazardous chemicals in our everyday environments and targets students in grades 6-12. The site features an accompanying curriculum, “Discovering the Connection: Your Environment, Your Health,” which was pilot-tested in six schools around the country. The site for NLM’s Native Voices exhibition offers lesson plans that enhance the experience of visiting the exhibition, in person or online, and integrate scientific and social issues. 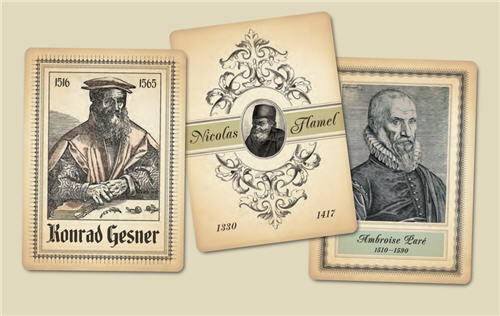 Harry Potter’s World, Renaissance Science, Magic, and Medicine is a popular HMD site that challenges older students to discover and discuss the genetic traits and inheritance patterns in the characters from the famous series. The Harry Potter site is one of two-dozen HMD exhibitions that come with detailed online lesson plans. Trading Cards from Harry Potter’s World Exhibition at the National Library of Medicine. Educational consultant Daniel M. Levin, PhD praises the HMD exhibitions because they cover both the history of science and of medicine, which typical science classes fail to address in depth. HMD’s charge is to “develop resources that examine and interpret the ongoing interaction between science, society, and the humanities,” with the goal of supporting lifelong learners. To fulfill that mission, HMD enlists educators across a broad spectrum of disciplines spanning history, literature, social studies, and technology. In addition to lesson plans, HMD also offers other K-12 resources, ranging from exhibition tours, school field trips and professional development programs for educators, to higher education modules, and online interactive or reflective exercises. Jiwon Kim, of HMD, believes NLM programs help develop students’ critical thinking. “Our goal is not to provide comprehensive information on a topic, but rather a solid starting point to engage student’s interest through exhibitions that examine the history of medicine and important library collections,” she notes. NLM spreads the word about its teaching tools through professional development workshops and teacher conferences, school field trips, NLM regional libraries, and school and public libraries. How important are NLM Teacher Tools? October 1, 2014 in Products.